We must put corporations in their place and acknowledge that money is a commodity, not speech. Image from Move to Amend. For five years, ever since the illogical and corporatist Supreme Court decision in Citizens United v. FEC, which reaffirmed that corporations have the personal rights of citizens and held that money is speech, I have wanted to find an effective way to correct the damage those five Supreme Court Justices did to our system of government and our Constitution. Recently, I found what I was looking for. 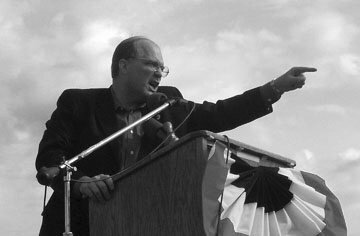 I heard David Cobb speak about the the slow rise of corporate rights in this country — rights that are mistaken, but threaten to overcome the Constitutional framework devised by James Madison and others in 1787 and ratified in 1789. Corporations were once granted limited privileges, which have morphed into nearly unlimited rights conferred by an extremist judiciary that disregards the foundations of our democratic republic — a republic created by real people, not artificial entities. Money is not speech, and therefore the expenditure of money to influence the electoral process is not a form of constitutionally protected speech and may be regulated. The story that Cobb tells about this country cuts across most ideological and political positions. Until I heard Cobb’s message, I had thought that an attempt to amend the Constitution in these ways was unrealistic, given what I perceive as the nearly insurmountable differences in the nation. But the story that Cobb tells about this country cuts across most ideological and political positions. It can appeal not only to progressives, but to moderates and conservatives as well, because it is the American story. And it is one to which we all can relate. I have been aware of several groups promoting an end to the corporate funding of elections made possible by Citizens United. But Move to Amend takes the needed reform beyond merely fixing the Citizens United problem. It ends corporate rights and returns them to corporate privileges granted by “We the People” through our government — the way it was in the beginning of this country until the courts began granting corporate rights just over 100 years after the Constitution was ratified. In 1886, the U.S. Supreme Court started the ball rolling for what is now called the personhood of corporations. In Santa Clara v. Southern Pacific Railroad, the court held that corporations were entitled to rights under the 14th Amendment — the amendment that was intended to give equal rights to African-Americans who had been burdened by slavery in our country. From that moment to this day, corporations have slowly, case by case, moved the courts to grant them more and more of the rights that should inure only to natural persons. For more details, go here. Move to Amend’s David Cobb. Cobb began his lecture by explaining some basic concepts about our system of government: democracy, the sovereignty of the people, legal “personhood,” and the role of corporations in the history of the country. For about the first hundred years after our nation’s founding, for instance, corporations were created essentially by a legislative process that required them to serve some public interest (or not harm the public interest) and limited how long they could exist (usually 20 years or less). Now, corporations are created by filling out a few forms, naming officers, and paying a nominal filing fee to some agency of state government; and they exist in perpetuity. These court-awarded rights for corporations affect almost every aspect of our democracy. Move to Amend argues that these court-awarded rights granted to corporations affect almost every aspect of our democracy — campaign finance, environmental justice, civil rights, GMOs, food quality, water quality, air quality, sustainability, educational standards, school discipline, gun laws, the prison industrial complex, city zoning and (re)development, and more. These rights go far beyond anything allowed by the original method for creating corporations, and they benefit corporate interests at the expense of the public good. Corporations have no consciences, no beliefs, no feelings, no thoughts, no desires. Corporations help structure and facilitate the activities of human beings, to be sure, and their “personhood” often serves as a useful legal fiction. But they are not themselves members of “We the People” by whom and for whom our Constitution was established. 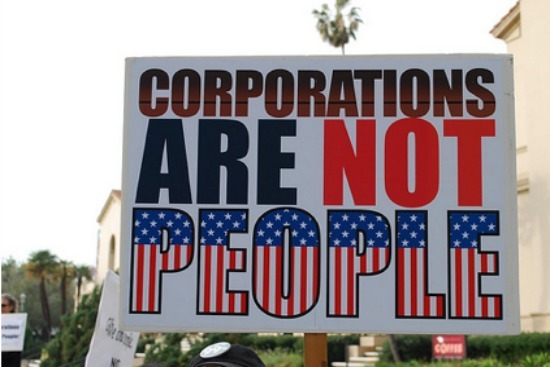 In fact, corporations are not even mentioned in the Constitution. But the key to understanding the harm of allowing corporations rights, rather than enumerated privileges, is found in the term “legal fiction.” As Cobb points out, it is self-evident that a fiction is something that is not true. So corporations not only have gained protections from liability for their owners (the main purpose of the corporate structure), they now have a broad range of rights which were intended by the framers only for actual human beings. 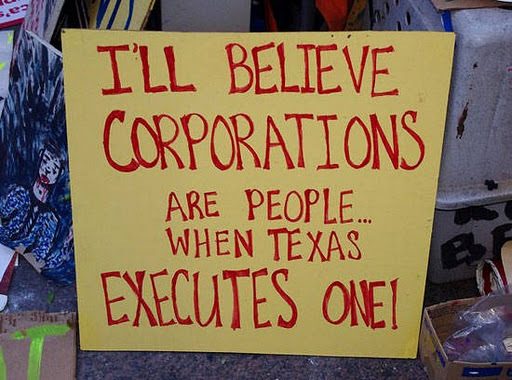 And it is simply not true — it’s a fiction — that corporations are persons entitled to rights under our Constitution. Under the United States Constitution, We the People are free and sovereign because We hold all the political power, but We wisely delegate a certain amount of our power to government — which will always be subordinate and accountable to We the People; and We charge government with the duty to write laws in the public interest — laws that express public policy — but the one thing no public law legitimately can do is violate the private civil rights of the free and sovereign people who live under our Constitution. Most of us can appreciate the wisdom of this framework for self-government. Most of us can appreciate the wisdom of this framework for self-government. However, as Cobb points out, even the remarkable system explained in that long sentence left out a few things. In 1789, only white male landowners were counted as citizens. They represented only 6% of the adult population. It took 200 years of struggle (and still counting) for women, African-Americans, the poor, workers, and others to achieve the rights of that first small group of white male landowners. And not only was the indigenous population of this country not afforded citizenship in 1789, they were systematically killed off by European diseases and massacres supported by our government until only 10 to 20 percent of that population survived and was forced onto resource-deprived reservations. Now that corporations have achieved such dominance over our government, with the government mostly doing the bidding of those corporations, one member of the audience suggested that we have moved from being a democratic republic into a form of fascism. Cobb responded that he was glad to hear someone mention the F-word because it is entirely appropriate. And this merger is what has happened in the United States. When the country is controlled by an oligarchy, made up of the wealthiest corporations, that seeks to give people choices only about consumer goods and materialism, we have become fascistic. In fact, it has become often impossible to identify clearly where the role of government differs from that of the corporations. Each is the servant and the master of the other. The corporate oligarchy seeks to limit or control the discourse among people. The corporate oligarchy also seeks to limit or control the discourse among people and prevent meaningful communication. The ideas that we find discussed nationally are circumscribed by the corporate media, causing those of us who are dissatisfied with the status quo to seek out alternative media to learn about and make sense of what is happening in our own country. As long as money is officially viewed as free speech, rather than the property or commodity that it is, and corporations are allowed to spend as much of their money as they like on political campaigns, it will be difficult for We the People to control our destinies. When that circumstance is combined with the development of corporate personhood, corporations will remain dominant until the people force these conditions to be changed. And this is where Move to Amend comes in. Its goals are to achieve a constitutional convention or an amendment to the Constitution in the next 10 years or so that will amend the Constitution in the two ways mentioned at the beginning of this article, namely, to end giving corporations the rights of human beings and to declare in the Constitution that money is not speech, but a commodity. On April 29, 2015, a proposed 28th Amendment was introduced in Congress as House Joint Resolution 48 and can be found here. Its efforts are focused on building a grassroots movement that is already slowly spreading throughout the country, approaching 400,000 members, with numerous coalitions with existing organizations and groups. Already, hundreds of resolutions, ordinances, and ballot measures against corporate personhood have passed. The ballot measures have succeeded, usually with overwhelming support (even in areas that normally vote conservative). And none have failed. To learn more about Move to Amend, go here. You can watch one of David Cobb’s speeches about corporate personhood and the nature of free speech given near the end of last year, here. This entry was posted in RagBlog and tagged Citizens United, Corporate Personhood, David Cobb, Lamar W. Hankins, Rag Bloggers, Supreme Court, U.S. Constitution. Bookmark the permalink. For once, I am glad that I am able to agree with Lamar. Well written article about an important topic Nice job! I will check out what Cobb has to say on this matter. I find it immensely entertaining to point out to my republican friends that they lambasted Obama for years about the fact that the details of ObamaCare were intentionally hidden from the public and as Nancy Pelosi famously commented, “You have to pass the bill to know whats in the bill”. Now fast forward to cheering republicans in the Senate who enable fast track privileges for Obama to negotiate the TPP .. a highly secretive treaty, hidden from the public, which likely negates certain rights within our constitution, binds Americans to international judicial norms and agreements, and immensely strengthens the power and influence of global corporations at the expense of individual liberties. I think more and more these days, that my old flame thrower Richard was right … they are all corrupt and none is worth electing .. so lets just burn the mother down and enjoy the chaos. The analysis is fine, but the strategy is ridiculous. Any approach that relies on a constitutional amendment requires super majorities of already corrupt politicians in both houses of Congress plus 3/4 of the state legislatures to turn on their patrons. Not likely. The only real solution to Citizens United is for a future Supreme Court to overturn that 5-4 decision. The very likely winner in 2016, Hillary Clinton, has already stated that opposition to Citizens United would be her “litmus test” for SCOTUS appointees she might nominate. Of course, she lies, but in reality that’s our best shot. Not that I’ll actually support her, since I don’t live in a swing state, but I would pull a lever for her if I did, just for that one reason.